With lightning-fast print speeds of 31 pages per minute (ppm), automatic duplexing, and a high resolution on every page you print, the HP Color LaserJet 4700dn printer does it all. Your office depends on this trustworthy workgroup printer to produce legible documents and professional-quality photo prints, but your print quality is only as good as the toner that’s inside your device. 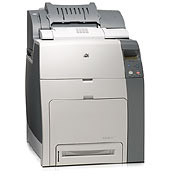 Buying toner for HP Color LaserJet 4700dn printers can be difficult because of the high cost of original equipment manufacturer (OEM) products. OEM cartridges can cost hundreds of dollars a piece, but you could be getting OEM-comparable quality and performance for a fraction of the price with 1ink.com. Affordable toner that actually produces quality results is attainable when you buy your printing supplies from 1ink.com. Our remanufactured HP 643A toner produces flawless results without voiding your printer’s warranty. You’ll get the exact same product specs as an OEM cartridge would offer as well as the same stunning print quality, all while saving money for your business! Trust 1ink.com to bring you the best products and service at the lowest prices.